Sault Ste. Marie is a city of approximately 78,000 people, in Northern Ontario. Directly across the St. Mary's River -- and the Canada/US border -- is its twin city, Sault Ste. Marie, Michigan. 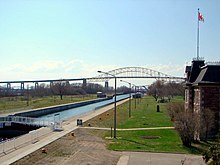 The twin cities of Sault Ste Marie (Ontario) and Sault Ste Marie (Michigan) straddle the international border between Canada and the United States of America; they are connected by a bridge across the St. Mary's River. The area boasts rugged shores, sandy beaches, untouched forests, winding rivers, and two Great Lakes. The history of the area involves an eclectic mix of cultures; once called "The Meeting Place", it drew inhabitants from all over Europe and from North American tribes. The Ojibwe natives originally called this area Baawitigong, meaning "place of the rapids." The rapids long represented an obstacle to voyagers heading westward to Lake Superior; since at least the era of the French coureurs du bois, traders needed to portage here. In the 1600s, Sault Ste. Marie was established as a fur trading post. From 1668 to 1817, Sault Ste. Marie was a single settlement on the St. Mary's River in North America's Great Lakes region from 1668-1817. Later, it was divided by the establishment of the Canada-US border to form the twin cities. In the War of 1812, while the city was still a single settlement, it was a strategic point on the frontline due to its control over access to Lake Superior. Later in the 1800s, canal locks were constructed on both sides of the boundary to bypass the rapids. During the 1900s, Sault Ste. Marie was a site for steel making. Today, Recreational craft and tour boats in the area use the Sault Ste. Marie Canal, on the Canadian side of the border. Large, ocean-going cargo vessels use the Soo Locks on the American side. 46.485-84.50941 Sault Ste. Marie Airport (YAM IATA), 475 Airport Rd (take Second Line and turn south to Airport Road), ☎ +1 705-779-3031. Sault Ste. Marie Airport is 20 km from downtown on the western outskirts. Airlines serving the airport include: Air Canada Express with frequent daily flights to Toronto-Pearson, Porter Airlines to Toronto Downtown Airport YTZ, Bearskin Airlines to Ottawa (via North Bay and Sudbury) and Thunder Bay, and Sunwing Airlines (seasonally) to Varadero, Cuba. There is no bus service from the downtown area to the airport. Taxis and limos provide flat-rate service between the airport and anywhere in the city. Taxi: 7500 Taxi, +1 705-945-7500. Car rental is available from Avis and National. Also airports on the Michigan side: Chippewa County (CIU IATA) and Sault Ste. Marie Municipal (Sanderson Field, SSM IATA). Sault Ste. Marie is not linked to any other major city by passenger train. As of 2015, Algoma Central Railway still provides passenger service north of the Sault to Hearst. This train makes all station stops and can drop off and pick up passengers at any point on the line, accommodating people heading to private camps, a wilderness lodge getaway, or to go fishing, hiking, snowmobiling, or ATVing. As there is no food service aboard the train, voyagers are encouraged to bring whatever food they will need for the journey. There are no reliable connections with Via Rail; the ACR line crosses with the routes of the Canadian in Oba and the Lake Superior at Franz, but wait time to make the connection can be 24 hours or more. There is no station building or other shelter at either stop. There is a bus connection in Hearst to Cochrane. Algoma Central Railway, 129 Bay Street (west of the Station Mall), ☎ +1 705-946-7300, toll-free: +1-800-242-9287. Train station with ample free parking for rail passengers. Trains operate three times a week on separate summer and winter schedules. Local politicians and interest groups are lobbying the government to reinstate passenger rail service between the Sault and Sudbury; however, this seems unlikely to happen in the near future. Funding for the existing passenger service to Hearst was slated for termination in 2014, but that service was given a reprieve until 2018 and its operation contracted to a Canadian subsidiary of Railmark Holdings. Highway 17, which is part of the Trans-Canada Highway system, connects the Sault with Thunder Bay to the northwest and Sudbury to the east. The International Bridge crosses the St. Mary's River and connects with the beginning of the Interstate 75 freeway in Sault Ste. Marie, Michigan, USA continuing further south to Saginaw, Flint, Detroit, and eventually Miami, Florida, USA. A new limited access truck route known as Carmen's Way (after the late MP Carmen Provenzano) provides easy access to main roads and Hwy 17. Plans are under way to connect Second Line to a four-lane section of Hwy 17. Ontario Northland provides bus service to and from the Sault. Eastbound buses go to Sudbury, where onward connections are available to Ottawa or Toronto. Westbound buses follow the Trans-Canada Highway through Wawa to White River. There are approximately 400 km of snowmobile trails in the Sault area and 1,000 km of trails in the Algoma district with connecting trails to Sudbury. Trails are maintained by the Sault Trailblazers Snowmobile club and the Ontario Federation of Snowmobile Clubs (OFSC) and they operate on a user-pay system that requires users to purchase a trail permit. Official staging area is on the north side of McNabb Street one block east of Black Road. Sault Trailblazers Snowmobile Club for more information. Getting around is easy - you can walk, bike (if you don't mind getting clipped off by cars) or take the bus... it is a big town with a small town atmosphere. If you are driving, don't expect any traffic jams or road rage. This is a nice, relaxing place to be and it is very convenient to get around. Beaches, rugged outdoors and ski hills are less than 30 minutes away from the city centre. Sault Transit Services operates from a central transit terminal at 160 Queen Street East at Dennis St. There are 8 regular routes running 19 hours a day, 7 days a week except statutory holidays: New Year's Day, Good Friday, Victoria Day, Canada Day, Civic Holiday, Thanksgiving Day, Christmas Day, and Boxing Day. Cash fare is $2.85 for all riders (Dec 2018), and you must have exact fare as drivers do not provide change. Children 12 years of age and under ride free when accompanied by an adult; to qualify, children must be under 5 feet (150 cm) tall. You can also get a multi-ride pass with 20 rides for $45. Monthly adult, student, and senior passes are available upon advance purchase. If paying fare by cash or multi-ride pass and you need to use more than one bus to complete your trip, ask the driver for a transfer after you pay the fare. Request stop service, where the driver will let you off at a location along the route other than a bus stop, is available in the evenings -- either when the street lights turn on, or after 9PM, whichever is earlier. Speak to the driver a few blocks in advance, and they'll let you off as close as possible to your request, so long as they can stop safely. Exit via the front doors. Parabus Service: Sault Transit also operates a Parabus service for passengers with disabilities. Trips on Tu-F are booked the day before; trips on Sa-M are booked by F 4PM. Same-day service is offered if scheduling permits. Call the Parabus office at +1 705-942-1404 to book a trip. Visitors are requested to call the Parabus office to make arrangements. Cash fare is $2.85; a 40-ride pass is also available for $79. If the driver was helpful to you, it is customary to tip the driver about 10% and a dollar per bag that they carry for you (not just unload). At the very least, you should round fares up to the nearest dollar. On your visit you can walk to boardwalk along the river or take a Sault Locks tour to cruise the first canoe lock, the original Ermatinger-Clergue Old Stone House, Bush Plane Museum, the Sault Ste. Marie Art Gallery and Museum, and the Sault Ste. Marie Canal. Boardwalk along the St. Marys River with lovely views of the rapids and lake steamers. Well-lit. Along the waterfront in the city centre are many historic sites and attractions. Essar Centre -- sports and entertainment complex downtown - concerts & events. Agawa Canyon Tour Train - One of the most popular and scenic one-day rail excursions that takes visitors on a fully narrated tour non-stop to Agawa Canyon Park, 114 railway miles north of the Sault. There is a three-hour stopover at the canyon where there are hiking trails, a canteen, railway museum, and children's play area. This tour runs from mid-June to Mid-October. Most popular times are in September and October when the fall colours are at their peak. Train has dining cars and dome cars in addition to regular coach cars. The train cars have big windows, comfortable seating, flat screen monitors with front of locomotive camera, and GPS-guided narration in five languages (English, French, German, Japanese, and Mandarin). Tour of the Line - Travel to the end of the steel 396 mi (637 km) north at Hearst and see more of the rugged country past the Agawa Canyon. Unlike the Agawa Canyon Tour Train, this tour is on the regular passenger train. Passengers must provide their own food for the journey and there is a microwave and mini-fridge on the train. Also, passengers can bring coolers on board. Alcohol consumption is prohibited and the train is smoke-free. Restaurants in the Sault and Hearst also provide box lunches for the journey. This tour has a specially-priced return ticket that requires an overnight stay in Hearst and return to the Sault the next morning. Hearst accommodations are the customer's responsibility and they must be booked prior to the purchase of train tickets. Canyon Combo - Check your luggage at the train station the day before you leave, which will be loaded into the baggage car of the regular passenger train. You will first board the Agawa Canyon Tour Train and you have two hours at Agawa Canyon Park before you board the northbound train to Hearst. [dead link] Casino Sault Ste. Marie, 30 Bay Street West (near International Bridge), ☎ +1 705-759-0100, toll-free: +1-800-826-8946. Slots M-W 9AM-4AM, Th-Su 24hr; tables Su-Th 6PM-2AM, F Sa (6PM-4AM. Northern Ontario's first full-time casino features a 35,000 sq ft (3,252 m²) gaming floor, 450 slot machines, 21 gaming tables and a 100-seat restaurant and bar. By law, you must be 19 years of age or older to enter. Muio's, 685 Queen Street East (on the corner of Queen and East Streets in the downtown hub), ☎ +1 705-254-7105. Daily 7AM-8PM. Since 1961, Muio's has been home to family dining in the Soo. Chicken on a Bun, pizza, burgers, and fish & chips. Rockstar (Algonquin Hotel), 864 Queen St East, ☎ +1 705-253-2311. 11AM-2AM. Rock & roll attitude decorated with rock & roll memorabilia, live bands, DJs, large patio, mixed age, kitchen specializing in wings. Mobile service from Sault Ste. Marie westward through Thunder Bay to the Manitoba border is operated by TBayTel. The rugged landscape of this area, combined with the significant gaps between towers, means that a signal is by no means guaranteed. In Sault Ste. Marie, limited cellphone coverage can be expected outside the city centre, especially north (Fifth Line, Hiawatha Park) and west of town (Airport, Pointe des Chênes, Gros Cap). Coverage on Highway 17 north from Sault Ste Marie to Wawa is sporadic; huge areas have no coverage at all. Leave the beaten path (the Trans-Canada Highway or the few cities) and there's nothing. Much of the road to Wawa is parkland with few services of any kind. Roaming is supported for clients of the three major Canadian 3G networks (UMTS/WCDMA on 850/1900 MHz). There is no 2G capability. While TBayTel advertises something it calls `4G` in limited areas, this is HSPA+ (a faster version of the 3G UMTS standard) and not LTE. Unless your handset supports 3G/UMTS on the North American frequencies, you will get no service... not even to call 9-1-1 in an emergency. Do not rely on having cellphone coverage on this route! Before heading out on this relatively remote section of highway, it is strongly recommended to carefully examine your cell provider's coverage maps and bring appropriate supplies for use if stranded by a breakdown. Branches of the Sault Ste. Marie public library offer free Wi-Fi access. Sault College and Algoma University provide free Wifi for guests on their campuses. Customers of Shaw Cable from anywhere in Canada can take advantage of the numerous Shaw Go Wifi hotspots present in the Sault. Look for a ShawOpen SSID; after connecting, log in with your Shaw email address and password. As a rule, the most pressing concern for travellers in Sault Ste. Marie is property crime. Violent crime is most prevalent between people who already know each other (e.g. organized crime; domestic violence); stranger-on-stranger violence is uncommon. Do not leave any kind of valuables in your car. Thieves may break into your vehicle for a trivial amount of goods, causing much more damage than the stolen items are worth. If such items need to be left in your car anyway, at least conceal them. Valuables to safeguard include not only cash, but also electronics (including cell phones and GPS systems), firearms, alcohol, tobacco, and medication. In particular, opioid pain medications are a common target for theft. Do not leave bicycles unattended -- they will likely be stolen. Winters in Northern Ontario are often severe, making auto travel in winter an unpredictable venture. Whether travelling locally or on the highways, one must be prudent, allow extra travel time, and be prepared to be flexible with one's travel plans. See the Winter driving topic for a general backgrounder. Highway 17 North from Sault Ste. Marie to Wawa sits in a snowbelt and receives heavy amounts of snow every year. The prevailing westerly winds pick up moisture as they blow across Lake Superior, which then gets visited on the shoreline as lake-effect snow and snow squalls. As such, this section of highway is frequently closed in winter, sometimes for days at a time. Closures may occur because of crashes, because of whiteouts that reduce visibility to near zero, or because snow is simply accumulating too quickly for the snowplow crews to keep up. Highway 17 East is also occasionally closed by crashes or inclement weather, though considerably less often than the northern route. To the south, into the United States, US-2 is sometimes closed, as is the Mackinac Bridge; I-75 is very rarely closed, though if surrounding roads are, travel on it may be inadvisable as well. This city travel guide to Sault Sainte Marie is a usable article. It has information on how to get there and on restaurants and hotels. An adventurous person could use this article, but please feel free to improve it by editing the page. This travel guide page was last edited at 07:25, on 1 March 2019 by Wikivoyage user MuzikMachine. Based on work by Wikivoyage users Traveler100bot, SelfieCity, Ground Zero, Traveler100, K7L, LegendofFantasy and Wrh2Bot, Wikivoyage anonymous users 184.68.75.166 and 2001:56A:F290:8900:98C6:F0F5:8CD5:947E and others.